Fortnite update 8.20 is out today, and it's a doozy. The biggest addition is one that players have been waiting on for some time: a proper Battle Royale ranked mode in the form of Arena. While playing in Arena, players will earn 'Hype' "to advance to higher leagues and unlock exclusive tournaments, such as the Fortnite World Cup Online Opens," Epic explained. Arena will be available for solos and duos, with each mode broken into several divisions ranging from Open League to Champion League. To celebrate Arena mode's arrival, Epic is holding a $100,000 in-game duos tournament called the Luxe Cup on March 30 - 31. You'll need to reach Contender League in Arena in order to compete, and you'll also obviously need a battle buddy. The Luxe Cup will work similarly to the Fortnite World Cup Opens: all eligible players will duke it out on March 30, and the top 3,000 will fight for rank on March 31. Arena mode is exciting, but it's not the only interesting part of update 8.20. It's also added a new 'Forage' feature which lets you gather Fortnite peppers, Fortnite bananas, and Fortnite coconuts out in the world. Peppers boost your health regen and movement speed, bananas heal you outright, and coconuts restore either your health or shields. You can forage these in the desert and tropical biomes. Peppers should be especially useful in the new Floor is Lava Limited Time Mode, which forces players to race to high ground as rising lava encroaches on the map. As always, the update also contains a laundry list of balance changes. The new Fortnite Baller vehicle is at the top of the list for Battle Royale. Ballers no longer deal damage when you run into people, making hamster-style splatter kills a thing of the past. Epic says it's "not satisfied with the current use of Ballers," so it's planning another change in update 8.30 which will allow players to shoot through the Baller's glass housing. Other additions include a poison trap for Fortnite Battle Royale, a creature spawner for Fortnite Creative (I can't wait to see what people do with that), and a pirate questline for Fortnite Save the World. You can read the full patch notes here. 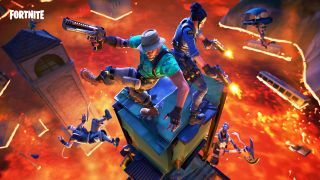 Here's how to complete the latest batch of Fortnite Discovery Challenges.